The experience is still too fresh to totally grasp the long-term implications, but I believe I’ve glimpsed the future of cruising…at least the future of Big Ship cruising. My week on the Norwegian Epic was an eye opener to say the least. Some of NCLs innovations are new and original. Others – like a completely separate, private and upscale class of accommodations & dining within the same ship – hark back to the grand trans-Atlantic ocean liners of the 1920’s, 30’s and 40’s. Given my decades of cruising, these are areas that stand out – in order of significance. Like the grand old days of ‘crossing the pond’, when certain decks or areas were off limits to passengers in anything less than the most expensive, upscale accommodations, the Epic has the ‘Haven’ area with its Courtyard Villas and private everything – butlers, dining room, fitness center, hot tubs, pool and sunbathing area. All of this is located forward on the top most decks, above the navigation bridge. Entering this exclusive area gives one the feeling of a ship within a ship – featuring the finer amenities of a five star luxury vessel – skillfully and tastefully integrated into a mass market, mega-ship. The fortunate and well-heeled residents of this lofty perch are able to descend and mingle with the hoi polloi whenever they so choose – to attend shows, experience any of the nine specialty restaurants or dine in any of the “complimentary restaurants” (a term used by NCL to distinguish the dining venues without additional cost from those with a surcharge – a ratio of four to nine). Another private neighborhood, albeit a little less exclusive, is the inside ‘studio’ cabin area. This inside area has a total of 128 rooms dedicated to single travelers. Again, access is via keycard. All cabins face inward to a private lounge / meeting area for singles. For some time now at-sea production shows have been getting bigger and better – closer to world class – blurring the long standing distinction between ‘entertainment’ and ‘cruise ship entertainment’. Given our experience on the Epic, any consideration that on board entertainment might be slightly diminished or ‘watered down’ due to its cruise ship venue has been effectively erased. 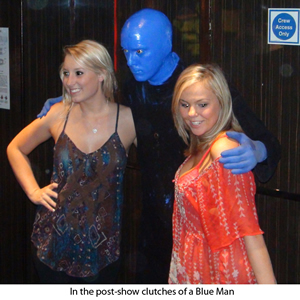 We thoroughly enjoyed The Blue Man Group, Second City Improv– both from Chicago – plus Legends in Concert from Las Vegas and a Cirque du Soleil type dinner show called ‘Cirque Dreams’. I can confidently say that these shows were some of the best entertainment I have seen anywhere – on or off a ship. As if that wasn’t enough, the above was complemented by a superb comedy magician (Jeff Hobson), a club dedicated to the blues (Fat Cats) and a ‘dueling pianos’ bar. The Manhattan Restaurant also hosted a full orchestra with vocal group on several nights and the Bliss bar featured karaoke for those with high levels of – occasionally unwarranted – confidence in their performing abilities. This was our first experience with Freestyle Dining. I had anticipated problems with waiting time and table service time but neither materialized. It is obvious how the ‘waiting-for-a- table’ issued is solved. There are digital displays throughout the ship showing availability and waiting time (if any) for each and every restaurant on the ship. The display is a matrix showing real-time status of each dining venue for each half hour for the entire evening. Advance reservations can be made and are recommended for the specialty restaurants, but not for the ‘complimentary’ dining venues. For those you show up at the entrance – give your cabin number to the hostess – obtain a beeper and head off to other activities until your table is ready – a far more civilized approach than milling around outside a ‘fixed seating’ venue with a herd of ravenous, sunburned passengers – ready to trample each other the second the dining room doors open. Not so obvious – how such a high level of table service is maintained at all times within the Freestyle format. We found service in all venues smooth, prompt and courteous regardless of the hour and number of diners. On my next NCL cruise I’d like to go behind the scenes and witness exactly how they pull that off! There are too many – nine to be exact – to sample them all in a seven day cruise. However – out of duty to God, country and TRO readers – we did our best – dining in as many different restaurants as possible – made easier by the fact that we were in a cabin designated ‘handicapped’ with extra wide doors – my reputation for gluttony having preceded me. Is it worth the surcharge of $10 to $30 per person for dining in the specialty restaurants? Is the food that much better? Bottom line for me – I found the food to be imaginative and of high quality in all restaurants, whether surcharged or not. The difference is in presentation and ambiance. In the Manhattan or Taste restaurants you dine very well – but with several hundred of your closest friends. 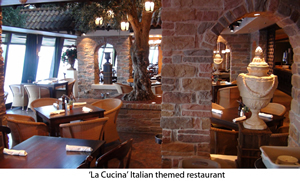 In a specialty restaurant – such as the Bistro (French, one of our favorites) you are seated in a quiet and elegant atmosphere with only a handful of other diners – making for a more luxurious and personalized experience. How do they do it? The ship was sold out…over 4,000 passengers on board. I anticipated long lines and interminable waits, but they never materialized. Boarding was a breeze…as was disembarkation. At disembarkation we took advantage of the ‘walk-off-whenever-you-want-if–you-are-willing-to-schlep-your-own-luggage’ offer and it was a quick and smooth. Additionally, after experiencing Freestyle dining it is hard to imagine going back to fixed. NCL is the pioneer in this innovation and they have perfected the process. Thank you, NCL for a wonderful experience. We’ll be back.